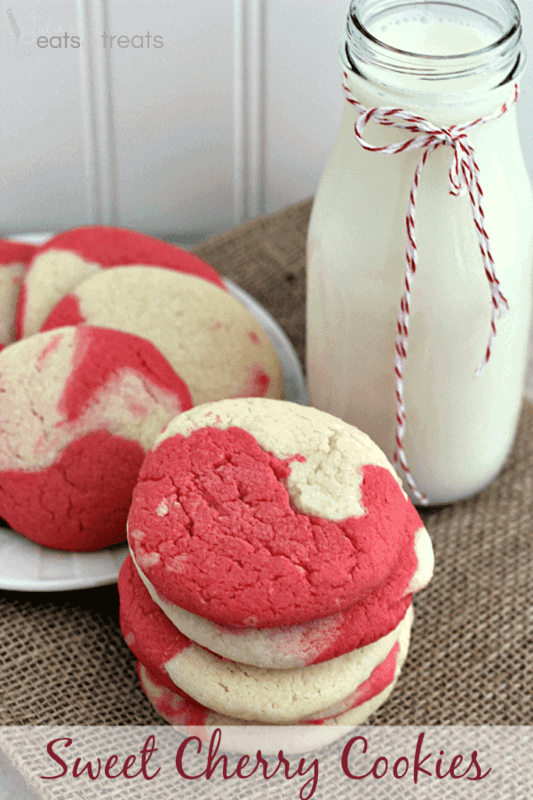 Let’s talk Christmas Cookies. Are you a total plan it out, bake ahead, freeze the cookies and you are done ahead of time with no pressure as the holidays creep up on you way to fast like every year? Or are you a whip it out at the last possible moment and make a total disaster of your kitchen? Maybe you participate in a Christmas Cookie Exchange so you just make a HUGE batch of one type then swap for the others? 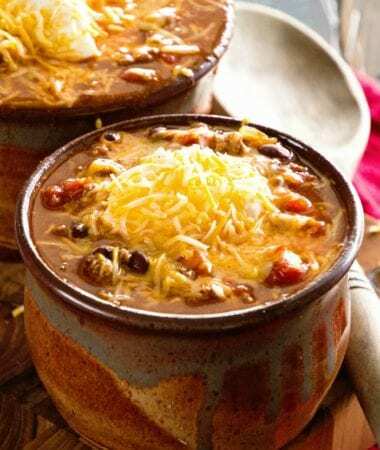 Do you search on Pinterest and try new recipes? Do you go with the standards and always make the same cookies you know everyone expects? I personally am a little bit of all of those. I, of course, try a few new recipes because I have to tempt you with some new cookies on the blog every year so that’s a given. There are a few Christmas cookies that my family might rebel if I didn’t make like my husband’s favorite Sweet Cherry Cookies or the Peanut Butter Ritz Cookies that we grew up on. I usually try to freeze as I go if they don’t disappear before I get them to the freezer. It’s a constant battle slapping the hub’s fingers and now Miss K’s to sneak them to the freezer. Even if the freezer is stuffed full you’ll find me baking up until Christmas time because obviously one can never make to many cookies for the holidays can you? I think not. This year with a newborn things might be a little on the slim pickings side. I have a few batches in the freezer but that might be how it stays! Hopefully this precious babe is an angel and doesn’t cramp my style or everyone’s expectations! These delicious cookies are based off of my Chocolate Cherry Thumbprint Cookies, but I switched out the cherry pie filling for mint fudge. My friend Lisa introduced me to the easiest way to make fudge last December when we were at Pillsbury together. This stuff is easy and delicious! 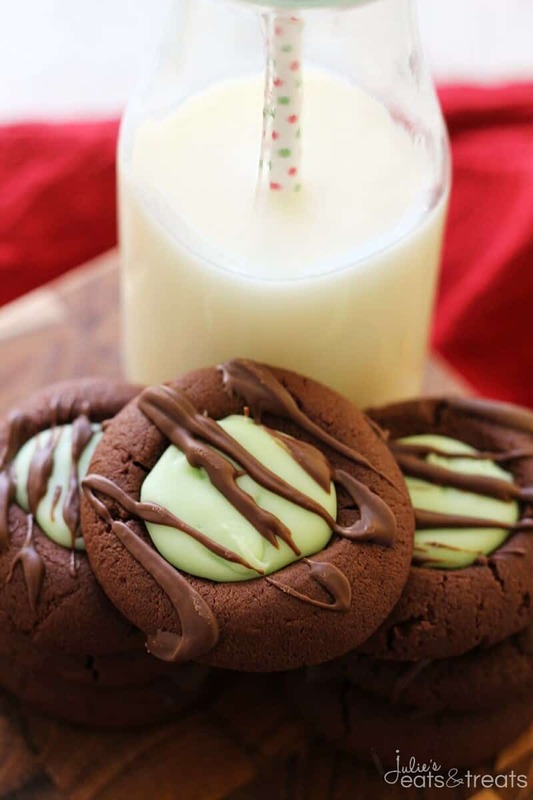 Then you drizzle a little chocolate over them to make them all fancy looking and they will be the star of your cookie platter at all of your holiday parties! Roll dough into 1 in. balls. Place on greased baking sheet or baking sheet lined with parchment paper. Press thumb into center of cookie to make a well. Bake at 350 degrees for 12 minutes. If the "thumbprint" disappear while cooking press center of cookie down again with the back of a wooden spoon or spatula. Cool on baking sheet 2 minutes. Remove to wire rack to finish cooling. For the fudge melt together white chocolate chips and sweetened condensed milk in small saucepan over medium heat, stirring continuously. Stir in mint extract. Spoon into center of cookies. Looking for more Delicious Cookies? 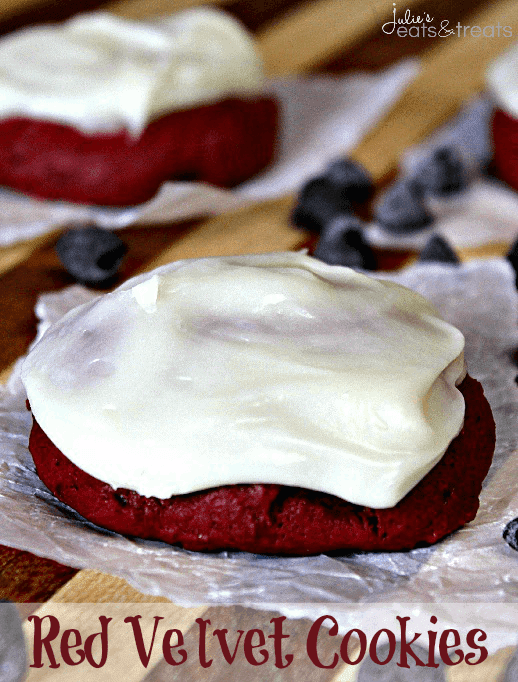 Red Velvet Cookies ~ Soft red velvet cookies stuffed with chocolate chips and topped with cream cheese frosting. Holy moly these cookies are amazing girl! I am a little bit of all those too 🙂 These cookies look incredible and definitely need to be added to my holiday cookie list! 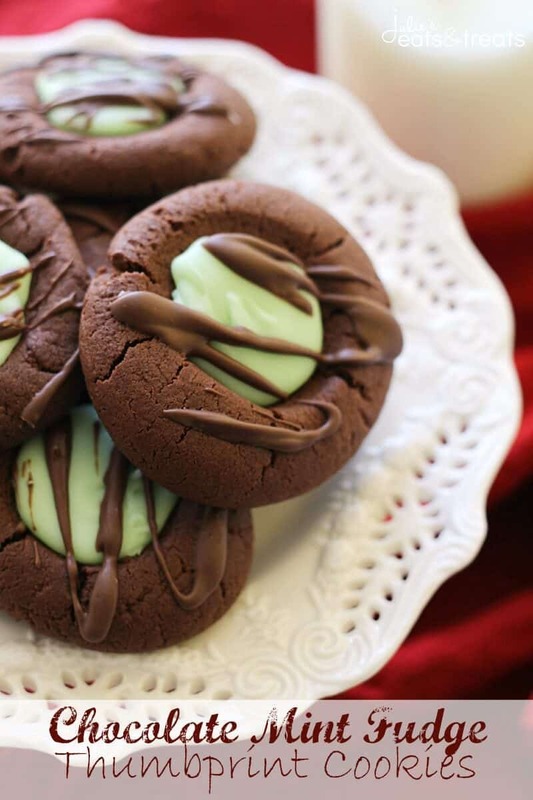 Love anything with mint and chocolate together! Your cookies look perfect! 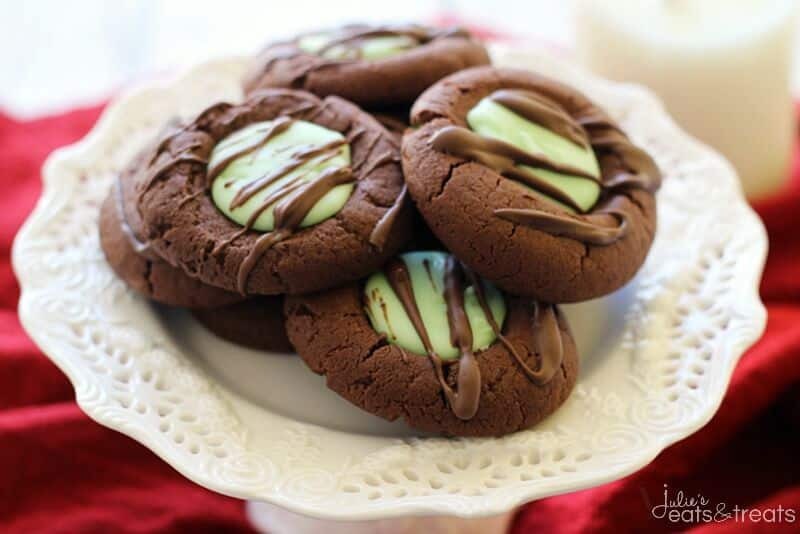 I love the chocolate and mint combo. Okay seriously, how cute are these? A must-have on the holiday cookie trays this year Julie! Ah sorry it should have been 1/2 can of the 14 oz sweetened condensed milk! I’m not familiar with Candiquik. Is it available in grocery store? Substitute? Thank you! It’s a type of Almond Bark! You can use any Almond Bark. So excited to make these! My first attempt at baking after major surgery so it may take me longer than it normally would. I LoVe mint! 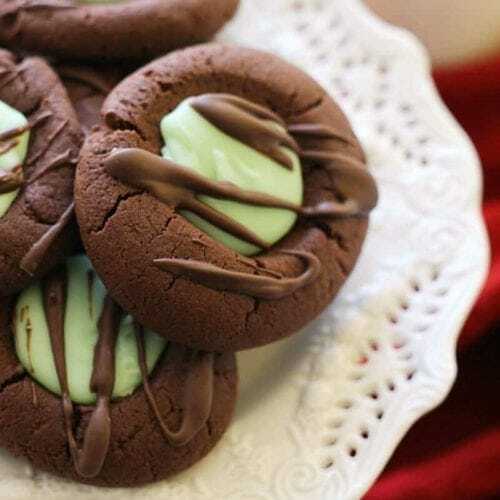 So I’m thinking of using less vanilla and adding mint to the actual cookie. Thoughts? You can do that if you really like mint, but I wouldn’t add as much mint to the dough as the vanilla extract as it’s stronger. Thanks for your reply. I’m just getting ready to make them now 🙂 I don’t know if they’ll be very photogenic though hahaha. Going to make these with the homemade mint extract I made with mint from my garden. Do I add the mint to the condensed milk or the white chocolate or after those two are combined? Can’t wait to make these! yum! Add after the two are combined. Are these chewy or crunchy? Yes I froze them and it worked great!